The DP-4000 is a high-performance differential pressure transmitter with a compact and robust Stainless steel electronics housing. The calibration / programming can be done very easy without test pressure by using the Unique One Touch programming button together with the Graphic display with back light. The multilingual graphic display can indicate a number of chosen engineering units including the process temperature as well as the mA output in a bargraph. Damping times can be adjusted and a 4-20 mA current simulation can be performed. For flow measurement a square root function is built-in with adjustable cut off point. The output is 4-20 mA including HART® protocol (HART® 7.0). ATEX II1G Ex ia IIC T6 Ga and IECEx approvals are available. 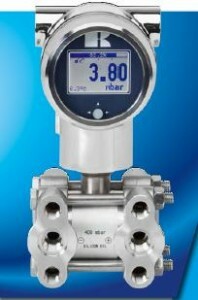 Klay Instruments has introduced a NEW ‘Intelligent’ Differential Pressure transmitter named DP-4000. This dP transmitter is standard equipped with a compact and rugged Stainless Steel electronics housing. The DP-4000 has a basic accuracy of 0.075% (Option: 0.065%) Ranges are available from 10 mbar to 20 bar with a turn down up to 100:1. The calibration / programming can be done very easy without test pressure by using the Unique ‘One Touch programming button’ together with the Graphic display with backlight. The multilingual graphic display can indicate a number of chosen engineering units including the process temperature and the actual value in a bargraph. Damping times can be adjusted and a 4-20 mA current simulation can be performed. For flow measurement a square root function is available and for Level measurement a tank linearization can be programmed very easy. Various remote ‘chemical’ seals are available. The diaphragm material is standard SS316L, as an option Hastelloy C or Tantalum can be supplied. The output is 4-20 mA including HART protocol (HART 5 and 7, selectable). For use in hazardous environments. The DP-4000 is certified according to both ATEX II1G (Ex ia IIC T6) and IECEx.